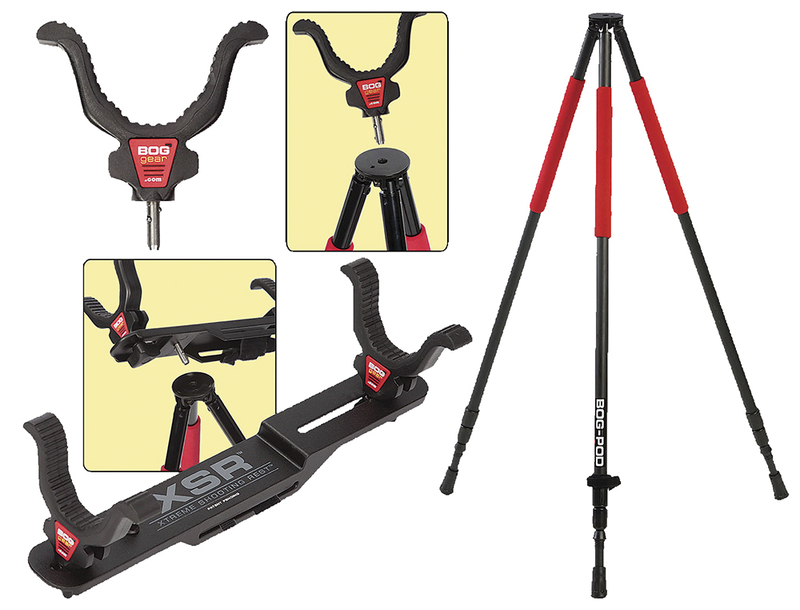 The Super Steady Combo (SSC) features three of Bog-Pod's most popular items in one combo pack - the Red Legged Devil tripod, the Universal Shooting Rest, and the Xtreme Shooting Rest. The RLD-3 can be used in the sitting position, going as low as 22" with the legs spread and adjusts all the up way up to a standing height of 68". It features rapid-adjust twist locks that loosen or tighten with just a couple of turns, inch markers on the middle leg sections and removable rubber feet that unscrew to reveal a carbide tip for better grip on ice and hard ground. The patented Universal Shooting Rest, with a quick-change stem, swivels 360 degrees, is rubber covered to prevent damage to firearm, and accommodates most gun stocks. The patented Xtreme Shooting Rest is perfect as a bench rest in the field, great for long-range shooting, and ideal for hunting from ground blinds. Made of lightweight, aluminum construction, the XSR is approximately 15.5" long, 2" wide and weighs about 18 ounces. It's perfect as a bench rest in the field, great for long-range shooting and ideal for hunting from blinds.